In this episode we create a classic Halloween witch with soft putty for that pointy, characteristic nose and colours included in a cheapo witch kit. This tutorial is based on a halloween witch kit that you should be able to find at your typical halloween dealer or party store. We’ve tried to use only the supplies found in the kit but we chose to create our own nose instead of using the included one. We sculpt the nose and chin using Kryolan soft putty. It’s sort of like a scar wax but it’s a little bit softer. The soft putty is sticky, so it’s important that you use a sealer when you’re done sculpting. That will protect the surface of your nose as well as making it easier to paint. You can of course use cotton and latex, tinfoil or other things to create the nose and chin of your halloween witch. It’s always difficult to get things to sit well on your chin, but we’re sure you can do it! 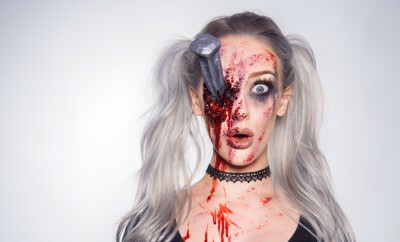 A great video to watch if you want to learn how to create and shape your face into something totally different is our Devil Halloween Makeup Tutorial. In the video we are using basic supplies as tinfoil to totally reshape the facial features. Also, it has one of the best intro songs we have ever produced 😉 Be sure to let us know what you think about it hehe. How can i get that clay? she still so hot afterwards. check out my sfx account please? I like the look but hate the wig. I could of gone with a green, purple, or black! Damn everything is happening in September! My birthday, the give away thing all month, and ZNation is coming back! God I'm exciteddd .3. Please do a medusa look!!! ellie you are the best in makeups can you do old doll makeup? Hahaha vad heter sången i början?? 7:00 look like a comic's no?please can you make a "dead Harley Quinn"? Hi! Do you guys know with what to replace a bold cap?? I am trying to do the wendigo make up :)) Love you guys! where can you get that sealer? would it work for home made scar wax( Vaseline and flour)? oh my gosh a subscriber giveaway is an epic idea, i hope i get a prize, i love these videos and i watch every single one. You know Halloween is hear when fx people make Halloween makeup!!! fantastic! can you do a replica of the demon/devil from Emperor's New Clothes by Panic! At the Disco? thanks! do a live stream plz!!!!!!!! I loved the intro song Kra kra kra! BTW, does the putty dry? Where do you get your contacts from?